Improving Conventional Enhanced Permeability and Retention (EPR) Effects; What Is the Appropriate Target? Molecular Imaging Program, Center for Cancer Research, National Cancer Institute, National Institutes of Health, Bethesda, Maryland 20892, United States. Nano-sized therapeutic agents have several advantages over low molecular weight agents such as a larger loading capacity, the ability to protect the payload until delivery, more specific targeting due to multivalency and the opportunity for controlled/sustained release. However, the delivery of nano-sized agents into cancer tissue is problematic because it mostly relies on the enhanced permeability and retention (EPR) effect that depends on the leaky nature of the tumor vasculature and the prolonged circulation of nano-sized agents, allowing slow but uneven accumulation in the tumor bed. Delivery of nano-sized agents is dependent on several factors that influence the EPR effect; 1. Regional blood flow to the tumor, 2. Permeability of the tumor vasculature, 3. Structural barriers imposed by perivascular tumor cells and extracellular matrix, 4. Intratumoral pressure. In this review, these factors will be described and methods to enhance nano-agent delivery will be reviewed. Keywords: Cancer, Nano-delivery, Tumor physiology, Enhanced permeability and retention effects. Nano-sized agents have a number of advantages over conventional low molecular weight agents including a large loading capacity, the ability to protect the payload from degradation, specific targeting and controlled or sustained release. (1-3) These features can be enhanced by changing characteristics such as size, the nature of the payload and surface features. (4,5) A variety of nano-sized, diagnostic and therapeutic agents have recently been synthesized for possible clinical application. (6-9) Nano-drugs are particularly relevant to cancer because tumors often possess a leaky vasculature compared with healthy vessels in normal organs. (10) When administered intravenously, nano-sized agents tend to circulate for longer times, if they are not small enough to be excreted by the kidney or large enough to be rapidly recognized and trapped by the reticuloendothelial system (RES). (11) Therefore, nano-sized agents with long circulation times leak preferentially into tumor tissue through a leaky tumor vasculature and are then retained in the tumor bed due to reduced lymphatic drainage. This process is known as the enhanced permeability and retention (EPR) effect. (12) Most nano-sized agents accumulate within tumors due to the EPR effect and then release their therapeutic payloads. However, EPR effects provide relatively modest specificity offering 20-30% increases in delivery compared with critical normal organs. Nano-sized cancer drugs have shown efficacy in animal models of cancer and several agents are in testing in clinical trials. (13, 14) However, response rates vary, likely related to the broad heterogeneity of EPR effects observed among tumor types and within individual tumors. The aggregate EPR effect is dependent on factors, (15, 16) in which tumor-specific biological features are considered to affect the heterogeneity, including 1. The degree of angiogenesis and lymphangiogenesis. 2. The degree of perivascular tumor growth adjacent to the vasculature and the density of the stromal response. 3. Intratumoral pressure. By manipulating these conditions, EPR effects can be enhanced leading to superior nano-sized drug delivery, thereby enhancing their anti-cancer effects. In this review, we first overview the basis of nano-sized drug delivery into cancer tissue, and then, discuss non-selective and selective molecular targeting methods for further improving the “permeability and retention” of nano-sized agents in cancer tissue compared with intrinsic EPR effects. In normal tissues, low molecular weight agents enter a mature, organized hierarchical vascular network, beginning with arteries, continuing to arterioles and ending in capillaries, whereupon the agents leak from the vasculature and distribute homogenously within the tissue according to a concentration gradient. In solid tumors several factors inhibit the homogenous distribution of low molecular weight agents, particularly within deep and central parts of the tumor. In contrast to low molecular weight agents, nano-sized agents have a number of advantages in this setting. In this section, we will describe the physiological characteristics of tumor tissues which present barriers to drug delivery, especially for non-targeted low molecular weight molecules (Figure 1). 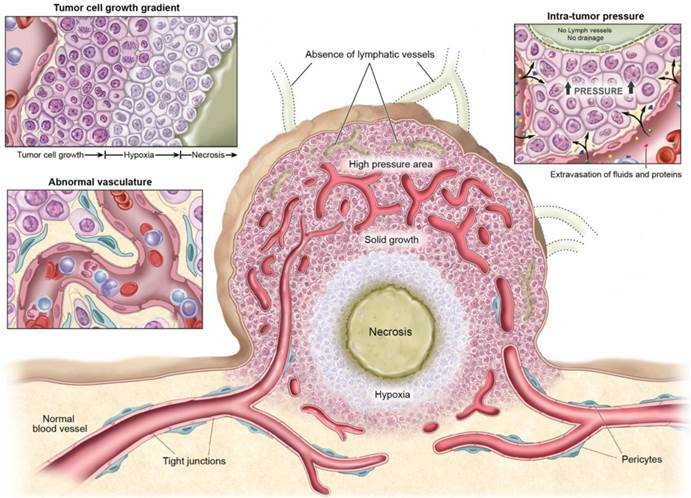 In order to grow, tumor cells recruit a neovasculature to ensure an adequate supply of nutrients and oxygen. As tumors grow they recruit new vessels or engulf existing blood vessels. 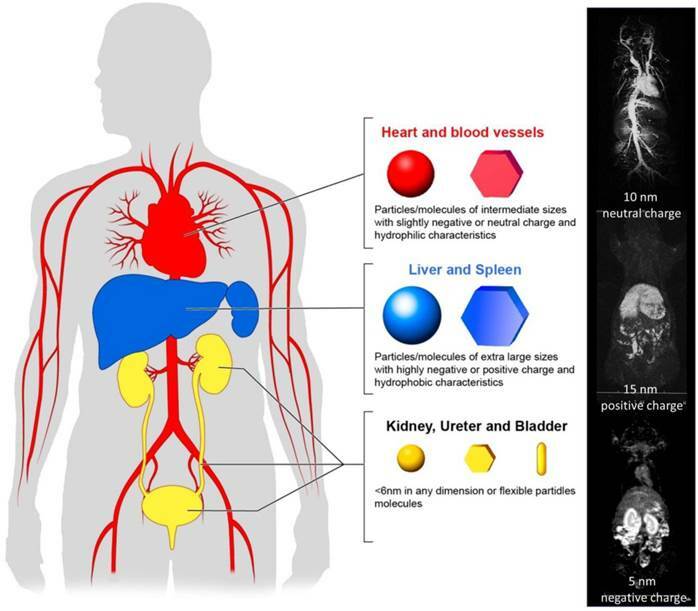 The imbalance of pro- and anti-angiogenic signaling within different parts of tumors creates an abnormal vascular network that is characterized by dilated, tortuous, and saccular channels with haphazard patterns of interconnection and branching. (17-19) Unlike the microvasculature of normal tissue, which has an organized and regular branching order, tumor microvasculature shows disorganization and lack of the conventional hierarchy of blood vessels. (20) Arterioles, capillaries, and venules are not identifiable as such and instead, vessels are enlarged and are often interconnected by bidirectional shunts. (21) One physiological consequence of these vascular abnormalities is heterogeneity of tumor blood flow, (22) which interferes with the homogeneous distribution of a drug within the tumor. Physiological characteristics of tumor tissue and vasculatures that can facilitate or prevent cancer drug delivery. Despite the barrier defect, central tumor vessels do not leak as much as expected due to the high interstitial pressure within tumors, which offsets the convective driving force favoring extravasation. High vascular permeability, coupled with mechanical compression of downstream blood vessels by tumor cell proliferation, causes an increase of interstitial fluids in the tumor. Furthermore, the lack of functional intratumoral lymphatic vessels inhibits the clearance of this extracellular fluid, further contributing to interstitial hypertension within tumors. (34) Elevated interstitial fluid pressure has been observed within various kinds of murine and human tumors. (35-37) In addition to inhibiting drug delivery by convection, increased interstitial fluid pressure further compresses blood vessels so that blood is diverted away from the center of the tumor toward the periphery. Tissue perfusion is also critical for achieving successful therapy. Nano-sized drugs administered into the blood pool must leak efficiently out of vessels and homogeneously perfuse pathologic tissue. Regions with poor perfusion and leakiness may be underdosed. In this section we will discuss the rational design of nano-sized agents that optimizes drug delivery, based on their physico-chemical properties (Figure 2). Nano-sized particles preferentially leak into tumors compared with normal tissues due to the EPR effect. (47) However, tissue perfusion of nano-sized regents is less homogeneous in cancer tissue because of inhomogeneous vascular distribution/permeability in tumors. This leads to regions of hypoxia and necrosis which occur at a distance from the vessels. (48) Therefore, better leakage and deeper penetration can induce greater therapeutic effects. Pharmacokinetics of nano-sized agents. Nano-sized agents, which are favorable for operating EPR effects, should stay in the blood pool for long time. Methods for improving cancer nano-drug delivery based on EPR effects by manipulating intrinsic physiological barriers. 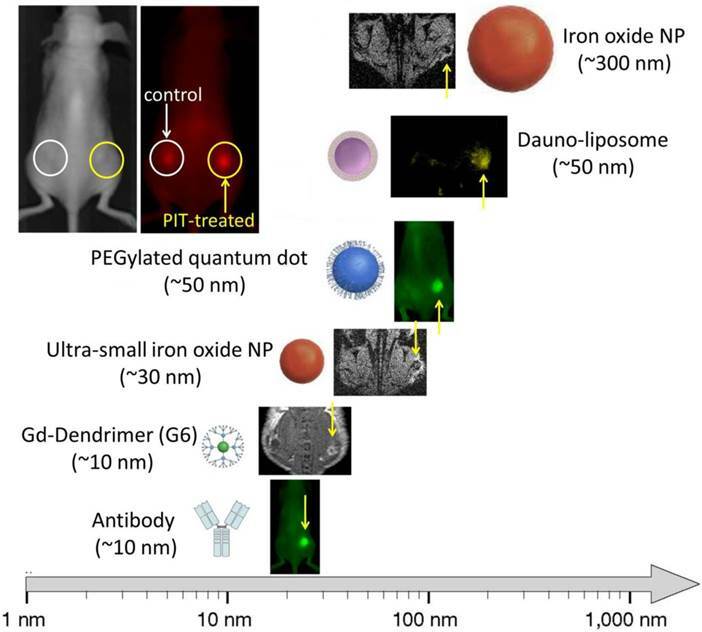 The previously described criteria for designing optimal nano-sized agents are based on the premise that a tumor arises de novo under physiologic conditions. When these natural conditions are artificially modified, unusually efficient drug delivery can be achieved. Three different conditions can be modified to improve nano-sized agent delivery; 1. Altering the normal physiologic condition without modifying the tumor environment. 2. Altering the condition of tumor vasculature or stroma. 3. Killing the cancer cells to reduce their barrier function (Figure 3). (50) Modification of one or more of these conditions can either improve or inhibit drug delivery, depending on local conditions. In order to improve the nano-drug delivery into cancer tissue and not normal tissue, one can increase the input function of the nano-sized agent. Normal vessels retain their ability to respond to extrinsic vasoconstrictors whereas tumor vessels lose their responsiveness to such agents. Muscular fibers in the vessel wall will contract, limiting blood flow in normal tissues. Therefore, when vasoconstrictive drugs are administered, normal vessels are constricted and blood pressure is increased. In contrast, tumor vessels do not respond to vasoconstrictors because of insufficient muscular structure. This leads to a relative increase in the input function into tumor tissues. (51-55) This phenomenon was recognized in 1970's during diagnostic angiography for tumor localization and was termed “pharmaco-angiography”. (56) During diagnostic angiography, vaso-constricting agents including alpha receptor agonists were injected to constrict normal vessels while accentuating tumor vessels. (57, 58) Later, pharmaco-angiography was used to constrict vessels after the delivery of nano-drug therapy to prolong the exposure of the tumor to the therapy. (59) Diagnostic pharmaco-angiography was supplanted by more sensitive techniques such as computed tomography and magnetic resonance imaging but the effect can still be put to use to selectively increase drug delivery. In recent work, researchers describe targeting the endothelial cells of the tumor vasculature by targeting the αvβ3 integrin using an RGD-peptide conjugated to a gold nano-particle. When light is applied, photo-thermal damage increases anti-tumor and EPR effects. (63) Similar effects have been seen with ultrasound microbubbles. (64) Damaging endothelial cells of the tumor vasculature might remove a barrier to drug delivery, however, it carries the risk of decreasing or even shutting down the tumor blood flow due to thrombosis thus, reducing the input function of drugs into tumors. Nano-drug delivery reportedly increases after many cancer therapies. The likely explanation for this is that tumor cells themselves act as a barrier to deeper penetration of nano-drugs. For instance, an one-time application of x-ray therapy, which damaged cancer cells but did not damage the vasculature in tumor tissue, increased the delivery of nano-sized molecules up to 2.2-fold at a peak of 8-12 hours after radiation. (75) That dose of radiation preferably killed well oxygenated cancer cells near vessels, therefore, temporarily increasing vascular permeability, when morphological changes were induced in perivascular cancer cells undergoing apoptosis. Interestingly, excess radiation damaged the vessels sufficiently to shut down blood flow and negatively affected nano-drug delivery. Similar vascular shut down has been reported during photo-dynamic therapy (PDT). (76) Since PDT damages both cancer cells and normal cells, PDT often reduces tumor blood flow. (77) Similar effects were observed with some chemotherapy including pacritaxel or docetaxel (78), which preferably killed tumor cells nearby blood vessels. In recent work, selectively targeting tumor cells, researchers describe targeting the cancer cells via the GRP78 receptor using a GRP78-targeting peptide conjugated to a PEGylated gold nano-rod. When light was applied, photo-thermal damage increased EPR effects up to approximately 2-fold compared with untreated controls. (79) Furthermore, systemic radioimmunoconjugates preferably killed perivascular tumor cells resulting in improved drug delivery. (80, 81) However, these methods could also damage tumor vasculatures resulting in thrombotic occlusion from the bystander effect. More recently, another more selective method of killing tumor cells to augment drug delivery, named photo-immunotherapy (PIT), has been described (82). PIT can specifically kill cancer cells exposed to near infrared light by inducing immediate necrosis without damaging normal cells (including vascular endothelial cells). Since most of the initial cell killing occurs in the perivascular tumor sheaths, increases in nano-drug delivery up to 24-fold compared with untreated control tumors, can be observed. (83) This increased permeability was induced immediately after exposure to near infrared light. Dynamic fluorescence imaging showed that intravenously injected, non-targeted polyethylene glycol coated quantum dots (PEG-QD) quickly accumulated in the PIT-treated tumor bed compared with non-treated controls (Figure 4). Histology after PIT showed a markedly dilated tumor vasculature in the widened tumor interstitium along with cancer cell debris. Additionally, intravenously injected PEG-QD leaked throughout the cancer tissue. Thus, PIT induces immediate necrosis especially in the layers of cancer cells surrounding the tumor vasculature without damaging vascular cells themselves. This initially leads to decreased interstitial pressure and a commensurate rise in perfusion. Therefore, PIT induces selective damage to perivascular cancer tissues thus, markedly augmenting the EPR effect and dramatically increasing drug delivery. This super enhanced EPR has also been referred to as SUPR to distinguish it from conventional EPR. Nano-sized cancer drugs are promising because they can be highly loaded with anti-cancer agents and intrinsically result in preferable tumor delivery based on the unmodified EPR effect. Several methods to improve nano-drug delivery into cancer tissue have been discovered. Those methods improved delivery by as much as approximately 2-fold compared with non-treated tumors. However, enhanced EPR effects which occur after PIT induces damage in the layers of cancer cells immediately adjacent to the tumor vasculature and have dramatic effects on perfusion with improvements in the delivery of nano-particles of up to 24-fold compared with untreated tumors. The magnitude of the nano-delivery improvement could have a direct impact on the therapeutic effects of nano-sized cancer drugs possibly resulting in dose reductions when used sequentially after PIT. Over all, more selective targeting of tumor vasculature that does not cause thrombosis would be a key for successful improvement of nano-drug delivery based on modified EPR effects. Super EPR effect induced by photo-immunotherapy can deliver various nano-sized (10-200 nm) particles 15-24 fold concentration into tumor beds. Hisataka Kobayashi is the Chief of the Molecular Theranostic Laboratory, in the Molecular Imaging Program at the National Cancer Institute of the National Institutes of Health in Bethesda, MD. Dr. Kobayashi received both an MD and PhD (Immunology/Medicine) from the Kyoto University in Japan. After a postodoctoral fellowship in the Nuclear Medicine Department at the Clinical Center of the National Institutes of Health he moved to his current position in the Molecular Imaging Program at NCI in 2004. His interest is in developing novel molecular imaging and therapy (theranostic) agents and technologies especially for targeting cancers. Rira Watanabe is a research scholar in the Molecular Imaging Program at the National Cancer Institute of the National Institutes of Health in Bethesda, MD. Dr. Watanabe graduated from the Hokkaido University in Japan and earned a PhD in veterinary medicine. She works in a pharmaceutical company as a senior researcher and is currently on sabbatical in the Molecular Imaging Program as a special volunteer. Her interest is in developing therapeutic methods through novel imaging techniques in oncology. Peter L. Choyke is the Director of the Molecular Imaging Program at the Center for Cancer Research of the National Cancer Institute in Bethesda, MD. Dr. Choyke is a graduate of Jefferson Medical School and received training in Diagnostic Radiology at Yale University and the University of Pennsylvania. He joined the Diagnostic Radiology Department at the Clinical Center of the National Institutes of Health in 1988 and formed the Molecular Imaging Program at NCI in 2004. His interest is in accelerating the treatment of cancer by using novel molecular imaging agents which target specific features of cancers. Corresponding author: Hisataka Kobayashi, M.D., Ph.D. Molecular Imaging Program, Center for Cancer Research, National Cancer Institute, NIH, Building 10, RoomB3B69, MSC1088, Bethesda, MD 20892-1088. Phone: 301-451-4220, Fax: 301-402-3191. E-mail: Kobayashnih.gov.